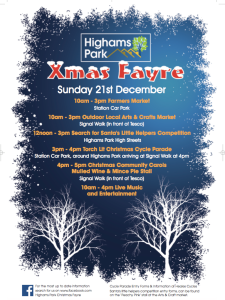 A fun day for all the family arranged by planning group members to try and put some festive spirit into the heart of Highams Park this Christmas with live entertainment, mulled wine and mince pies and much more! The Farmers’ Market has been persuaded to come back for an extra day on the 21st December with their artisan foods for the festive table, and the Woodford Wine Room will have a stall launching their new refillable wine bottles. In Signal Walk (by Tesco) there will be twenty arts and crafts stalls featuring the works and handicrafts of local artists and crafters. Local shops and cafes will also be open so you can get those last minute Christmas presents and have a cup of tea, coffee or glass of mulled wine whilst you enjoy your day. You can get more details from the attached poster and the local Facebook pages that you can access from the Shout Page of this website. © 2013 Copyright The Highams Park Plan. All rights reserved.